Next, have the children stick the butter into a microwaveable cup and melt it in the microwave oven. Then, help the children break an egg into the butter mixture, and stir. As the children are stirring, have them mix in 2 tsp of water to the egg and butter mixture. Put the Duncan Hines Chocolate Brownie Mix into a mixing bowl. Using a fork, add the egg and butter to the Duncan Hines mix and keep stirring until the mixture forms into a stiff dough. When the dough is ready, have the children take a tablespoon of dough and roll it into a cookie ball. Then, have the children place the cookie ball on a cookie sheet and flatten the cookie ball down just a bit. After that, have the children press the white chocolate round into the center of the cookie. Once done, have the children press four peanut halves, split sides down, into the top edge of each cookie, forming the bear claws. 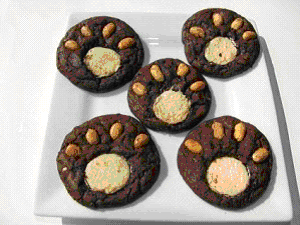 When all the Bear Claw Cookies are ready for baking, bake for 10 minutes or until the edges are set. Let the cookies cool for 1 minute on the cookie sheet. Then using a thin metal spatula, carefully transfer to a wire rack and let the Bear Claw Cookies cool completely.